Used to be, when it came to marketing Ottawa’s famous Rideau Canal, it was known far and wide as “The World’s Longest Skating Rink”. In 2008, the Guinness Book of World of Records officially declared Winnipeg’s 8.5-kilometre Assiniboine River Trail the longest naturally occurring skating surface in the world. This year, the Winnipeggers are expected to push that record distance even further, with the final skating area measuring more than 9 kilometres in length. So what is the NCC to do? 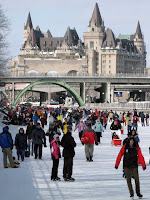 The fact that the Rideau Canal was the longest skating rink on the planet was its bread and butter, right? How could they continue the marketing and advertising of the Canal across Ottawa, Canada, and the rest of the world? Quite easily, actually. While the debate over which “rink” is the longest resulted in some spirited banter between Winnipeg North Centre MP Judy Wasylycia-Leis Ottawa Centre MP Paul Dewar, in the end, the NCC didn’t even put up a fight. It let the competition have their day in the sun, knowing that they had several other cards up their sleeve that would put them over the top. That’s why the NCC is proud to now call the Rideau Canal Skateway … “The World’s Largest Skating Rink”, stating that even thought it isn’t longer, it has most skateable space by surface area. It’s a simple fix that doesn’t destroy any of the brand recognition that the Canal has built up over the years. Good job on the NCC. Just goes to show that when a competitor tries to challenge your position in the market, you don’t just accept defeat — you have to think on your feet, play to your strengths, and look at new ways to present yourself to the public.